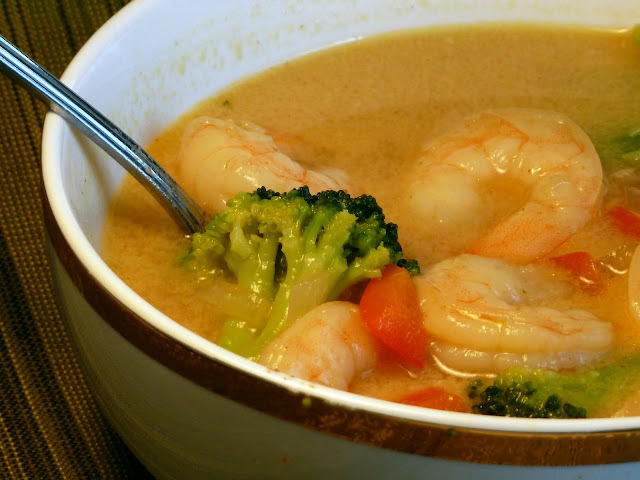 Just in time for Lent and meatless meals, here is a wonderful soup with shrimp, broccoli , onion, garlic,and red bell pepper in a flavorful broth with curry powder, crushed red pepper, coconut milk and chicken stock.This soup is easy to make, is low in sodium and fat, and tastes so good. As the broth simmers, your kitchen will smell so good!. The recipe is versatile, because the original recipe has fresh spinach, but I didn't have any, so I subbed broccoli. The recipe also called for red curry paste, and I used regular curry powder. I looked at red curry paste in the grocery store, and almost dropped the bottle, when I saw that it had 920 mg of sodium for 2 tsp.! Yikes. Obviously, I didn't buy it. I had made this soup before I saw Boulder Locavore's post on making your own curry paste, which I will have to do. When I first started blogging, I wanted to use my tried and true recipes, the go to recipes that you knew by heart. Now, the longer I blog, the more adventurous I am becoming with my cooking and baking, thanks to all of my Foodbuzz friends. I am discovering all sorts of food I had never used or seen before like pomegranates, dragon fruit, quinoa, Nutella, just to name a few. Thank you all for the inspiration to better with every post. Now, back to the soup. I adapted a recipe from Cooking Light 2006, and it is delicious. 1 1/2 teaspoons red curry paste, or regular curry powder. Heat a medium saucepan over medium-high heat. Coat pan with cooking spray. Add onion, bell pepper, and garlic; sauté 4 minutes. Add curry paste or curry powder and red pepper; cook 1 minute, stirring constantly. Stir in broth and coconut milk; bring to a boil. Reduce heat, and simmer, uncovered, 20 minutes, stirring occasionally. Add shrimp and broccoli (We don’t like mushy broccoli). Cook 4 minutes or until shrimp and broccoli are done. i havnt had many soups with coconut as the base (besides at thai restaurants), but this looks fairly simple to make! Stephanie- This soup is pretty easy to make, with just a few ingredients. Let me know how you like it. It looks delicious, so colourful! Looks like you are thinking spring!! Kim- This soup would be good with chicken, too. I'm thinking Spring, but Mother Nature isn't co-operating. We're supposed to get the "s" word today, I can't even say it. Becky - I loved hearing that you love to fill out March Madness brackets. I learned something new about you!! And once again - you are really tempting me to like seafood. This really does look so appetizing!! Brandie- You can also use chicken in this recipe, for those that don't like seafood or are allergic to it. March madness here we come! This soup sounds wonderful with spicy curry flavors and coconut milk, very nice! i haven't tried adding coconut milk to a soup but it seems like i don't experiment enough with my soup recipes.lol. i really should because your soup looks so healthy and tempting! Natasha- Thank you so much for your comments. Abeer- This was the first time that I had added coconut milk to soup, but it was so good.